James Miller Brown (1830-1926) – ASHLAR LODGE, No.3, A.F.& A.M.
James Miller Brown (23 January 1830 – 17 January 1926) was Worshipful Master of Ashlar Lodge, No. 3 in 1874 and 1875. Charter Member of Nanaimo Lodge, No. 1090 E.R. Charter Member of Caledonia Lodge, No. 478 R.S. Joseph Miller Brown – born 31 March 1867 (died 1942). Worshipful Master of Ashlar Lodge, No. 3 in 1895. Second, a brief history compiled by American descendants of James Miller Brown. Note: we have not fact checked any of this history at this time. We have added links for readers’ benefit. “George M. Brown came to this country [note: the United States] in 1862, arriving in San Francisco. He remained there for about 2 1/2 years, until he went to Vancouver Island with his brother James Miller Brown. He returned to [California] in 1866. He owned 78 acres, 2 1/2 miles north of Santa Clara [California]. He was one of the pioneer planters of pears and other fruits. And of course he has a street named after him in Santa Clara, U.S.A.
James Miller Brown was an even earlier addition to California having come over the California Trail. James had heard about the California Gold Strike in 1849 and came over with his mentor, Mr. Godsen, and [Mr. Godsen’s] two sons in 1850 on the sailing ship “Excelsior” and landed in New York. From there by train and canal boat to Pittsburgh, Louisville and Evansville, the latter in Indiana. Here Mr. Godsen Sr. and one son died of “Yellow Fever.” The remaining son returned to England leaving James Miller Brown. James then took up with a John Kennedy, a contractor on the Wabash and Erie Canal who was putting together a party for California. They left Evansville with 275 head of cattle, 16 head of horses and ten wagons. The journey [across country to California] took seven months and he finally arrived at Placerville, California where he made a “Tidy Sum.” He then left California for Panama and returned briefly to England. He returned to Vancouver Island and married Leah Westwood, a daughter of William Joseph Westwood and Elizabeth Tilley. The Westwoods had come over the California Trail from St. Louis in 1853 to Vallejo, California where they farmed [until] Joseph Westwood heard about gold on Vancouver Island near Victoria at Goldstream. Clarice Perkins, another descendant of James Miller Brown and Leah Westwood, contacted us through the dialog box at the bottom of this page and alerted us to this 1971 audio recording by Audrey Alexandra Brown, the grand-daughter of James Miller Brown and Leah Westwood, and daughter of Joseph Miller Brown, discussing her grandfather James Miller Brown. The original audio recording is held by the Nanaimo Community Archives. 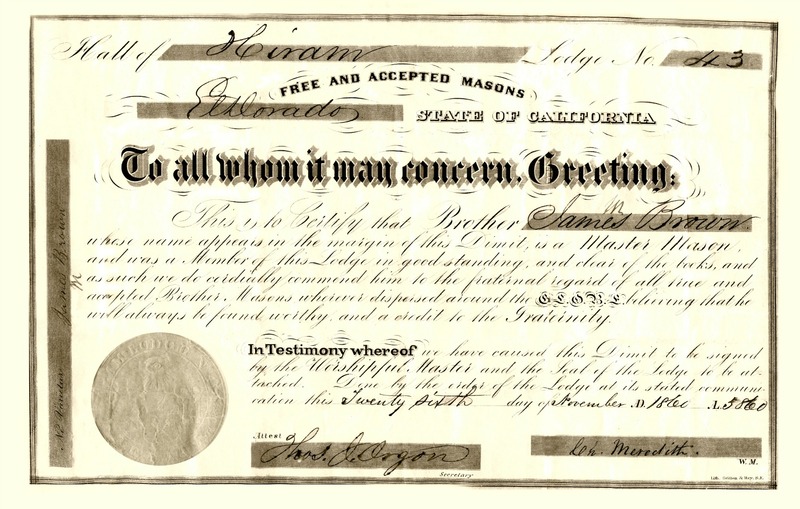 James Miller Brown Master Mason scroll, issued by the Grand Lodge of California, San Francisco, on 30 November 1860. The original is displayed in Ashlar Masonic Temple. James Miller Brown, Hiram Lodge No. 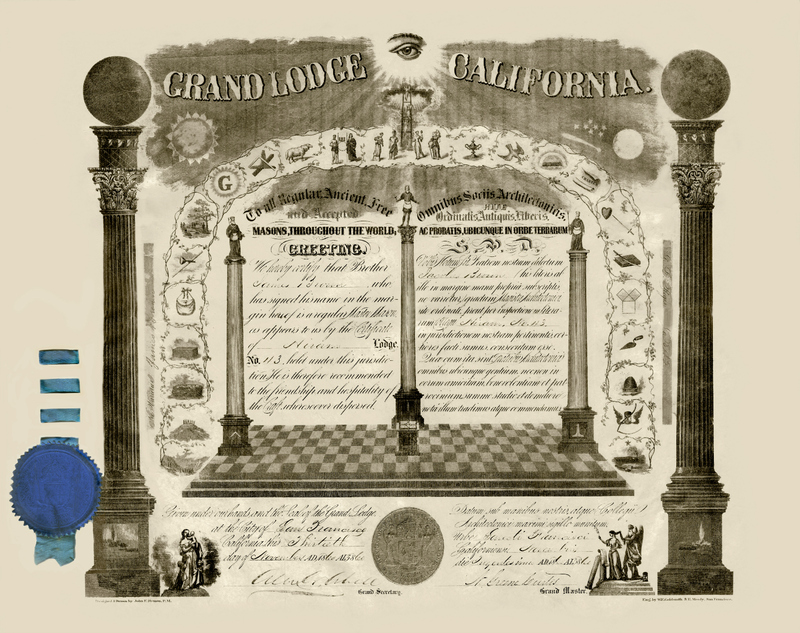 43, Grand Lodge of California, demit certificate, dated 26 November 1860. The original is displayed in Ashlar Masonic Temple. Here is a photo of the Brown family residence at 528 Hecate Street, Nanaimo, circa 1890’s. Nanaimo, Jan. 16 – James Miller Brown, aged 96, a resident of Nanaimo for the last 62 years, and reputed to be the the oldest Mason in the Province, died here this morning at his home, Knobb Hill. Born in Gloucester, England, he came to America when 13 years of age. He is survived by his second wife, eleven sons – James, Joseph, George, Godfrey, Victor, Horace and Rupert of Nanaimo; Benjamin, Union Bay; Henry, Vancouver; Ivan, Clarence and Arnold, Kamloops; also three daughters – Mrs. L.E. Mace, Miss E. Brown and Mrs. W. Wilson, Nanaimo. James Miller Brown, 96, Was Regarded as Oldest Freemason in B.C. Nanaimo, Jan. 16. – James Miller Brown, known to pioneer residents as “Tailor” Brown and the oldest Freemason in the province, died here at the age of 96. The late Mr. Brown, who leaves sixteen sons and daughters and as many grandchildren and great grandchildren living in this province, was born in England and emigrated to the United States when he was a mere lad. He took part in the California gold rush, where he made a stake and settled in Nanaimo as a merchant tailor in 1860. He retired from business a quarter of a century ago. He was married twice and is survived by his second wife and seven sons living in Nanaimo. They are Joseph, James, George, Godfrey, Victor, Horace and Rupert. Other sons are Henry Brown, vancouver; Ivan, Clarence and Arnold Brown, Kamloops; Benjamin Brown, Union Bay; Miss Ena Brown, Mrs. W. Wilson and Mrs. E. Mace, Nanaimo, are daughters. Mr. Brown was a charter member of Nanaimo’s first lodges A.F. & A.M. and was the first grand master [note: should read “worshipful master“] of Ashlar Lodge, Nanaimo. He is a past officer of the Grand Masonic Lodge. The death occurred at the family residence, Prideaux and Hecate streets, at an early hour this morning, of James Miller Brown, one of Nanaimo’s oldest residents, who had resided in the city and vicinity for upwards of 60 years. A native of Gloucestershire, England, aged 96 years, the deceased landed in New York from the Old Country in 1850 on the ship Excelsior, the voyage across the Atlantic having taken sixty days. He later moved to Evansville, Indiana, and in the following year joined in the rush to California, it taking the party seven months to cross the plains to the new gold diggings in the West. Mr. Brown went back to England from California for a visit and in 1863 arrived at Esquimalt, since which time he has resided in this province. He was one of the thousands who took part in the trek to Cariboo during the gold rush and operated diggings on Williams Creek. Arriving in Nanaimo during the late days of 1863, Mr. Brown married and settled in this district. He was a tailor by trade and was the oldest Mason in the province, having been a member of the Order for 71 years. He was a charter member of Ashlar Lodge of Nanaimo and the first Master of the Lodge [note: he was actually the second Worshipful Master of Ashlar Lodge. Mark Bate was the first, in 1873]. Besides his widow he is survived by twelve sons, James, Joseph and George residing in Nanaimo; Ben at Union Bay; Henry in Vancouver; [illegible] Clarence and Arnold residing in Kamloops; and Godfrey, Victor, Horace and Rupert residing in Nanaimo; and three daughters, Mrs. L.F. Mace, Mrs. William Wilson and Miss Ena Brown, all residing in Nanaimo. He is also survived by 26 grandchildren and 10 great-grandchildren. James Miller Brown is buried with his second wife, Louisa (nee Rumming) in Bowen Road Cemetery, Nanaimo, B.C. The photo below shows the location of the James Miller Brown grave in relation to the grave of James Miller Brown’s first wife, Leah (nee Westwood), which is just beyond the three large trees in the center-left background. Would you like to leave a comment or a question about anything on this page?